I recently received a question from one of my past class participants. (In fact I encourage all past students to feel free to use me as a reference; if I don’t know the answer I will do my best to find out the answer.) They were receiving cucumbers that were unusually bumpy or warty. The questions was if this would be a defect, and if so how bumpy can they be? How much is allowed? After a little research, I confirmed what I suspected. The warty or bumpy appearance is not a defect. There is a requirement that cucumbers be fairly well shaped or formed, but that has to do with the curvature of a cucumber, or if they become pointy or constricted towards the ends. Some commodities do have a requirement they be fairly smooth or reasonably smooth, but there is no requirement for smoothness, for cucumbers. As a guide, if you can slide a pen or pencil underneath the curvature of the cucumber, then the cucumber would be considered a defect, being scored as misshapen. I think that the Austrailian standards describe this defect. Also, from a marketing standpoint the appearance is in my opinion materially detracting. It is much harder to sell this fruit because of its ugly appearance. The enlarged lenticels tell me that a pathogen, spray, wash solution, or other material has enterred into the lenticel causing the enlargement. 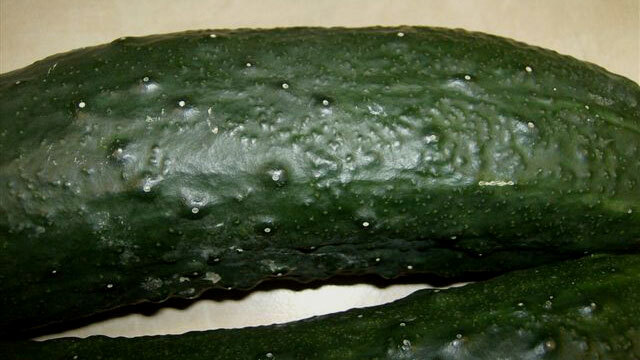 Your picture does not appear as bad as some of the Mexican cucumbers arriving into the wholesale markets. Try selling these in a wholesale environment against eastern US cucumbers. In dry years, however, Benlate should be avoided before mid-July. If a sudden heavy rain breaks the drought, fruit will size very rapidly. Rapid growth following drought stress often causes “lenticel splitting”. Lenticels that “split” appear as enlarged and roughened lenticels on fruit at harvest. Benlate sometimes increases the severity of this phenomenon. The interaction between Benlate and lenticel splitting is probably related to Benlate applications made during June, but later applications may also be involved. Ferban also causes enlarged lenticels.